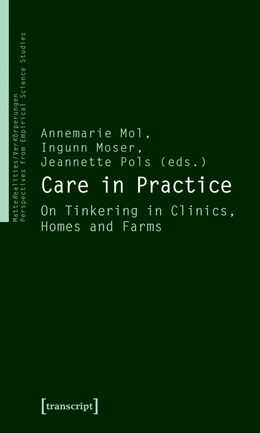 In a recent transcript publication «Care in Practice – On Tinkering in Clincs, Homes and Farms», Ingunn Moser, Annemarie Mol and Jeannette Pols assemble 14 articles around in what way “care” is a matter of “tinkering”. Addressing different areas between Science and Technology Studies (STS), Clinical Practice and Ethics, Medical Anthropology, Medical Sociology and Disability Studies, this book illustrates an inspiring path towards the questions how care produces or creates its objects, bodies, patients and carers; and how care incorporates knowledge and technologies. “Rather than presenting care as a (preferably »warm«) relation between human beings, the various contributions to the volume give the material world (usually cast as »cold«) a prominent place in their analysis” (Publisher). It therefore perfectly fits into general discourses amongst the STS community about relationships between scientific and technological innovations and society, and the directions and risks of science and technology. The book consequentially explores “care” and “technology” in their interplay and avoids to separating them as strong opponents. Since care can actually be found everywhere, it offers a fruitful perspective if seen as an alternative metaphor for world-making. What if we analyse, categorise and evaluate world, technologies, bodies and daily lives no in terms of e.g. construction, production or competition, but in terms of care? Thus the editors underline an aspect of inherent normativity in STS. If science is obviously so good in deconstructing things, then what do we care about, or: How can care be good? Assembling mainly ethnographic studies, the book hereby assembles consistent works of well acknowledged researchers such as John Law (this time: on veterinary practices) or Myriam Winance (on disability), complementarily enriched by further perspectives, for example by the artistic, performative austrian research group “Experiment!”. This entry was posted in care, Literature, report, STS. Bookmark the permalink.